If you're the kind of person who likes to know 'who's who' when you're reading a website, this is the page for you. Thanks for coming to find out more about us. Don't forget to introduce yourself so we can get to know you too. How is your maths? You may need a calculator to keep up. At the time of writing, we are a family of 17. That's 2 parents who had 4 kids who then married 4 others, who then started having kids, making the original 2 parents into grandparents and taking us to 18. This photo is the closest thing we have to an all family photo (yes, we are all focused on lunch. And no, sadly we're not all in it!). 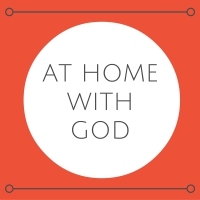 At Home With God started as a family venture back when the 'original family' were young, and in its new website form, draws in the new generation. 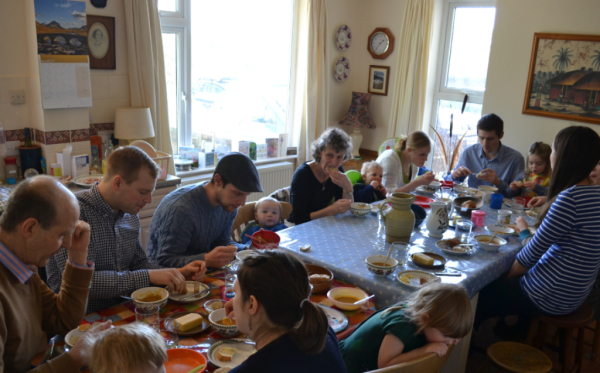 Together, we are working out what family discipleship looks like. Who are you hearing from? Hannah's role here is building the website and making sure you stay up to date. She's married to Joe and they live in Bristol. Her day job is working in the charity sector, making sure people know about great organisations helping people to do good things. Becky wrote the original At Home With God material for her kids: Nick, Lucy, Ben and Joe. She is married to David and is now also known as Granny to 7 grandchildren. 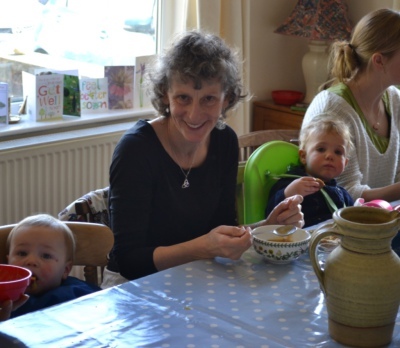 She is involved in parish ministry, leads retreats and leadership programmes, and cannot be beaten at many a board game. Claire is married to Nick and is Mum of 3. You can hear from her in the blog posts where she explores building faith in the family. Claire's background is in teaching, but these days she mostly bakes cakes and builds things out of duplo.